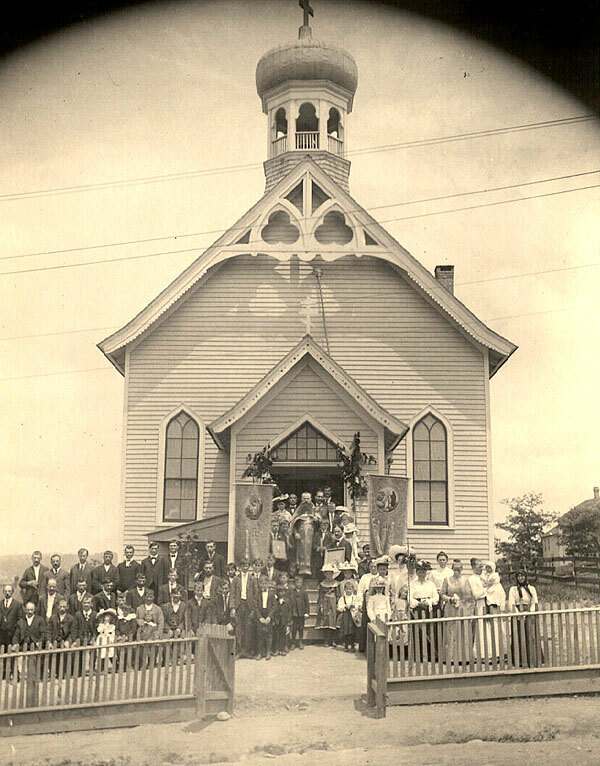 Between 1870-1920, Orthodoxy in America would change from a small mission in Alaska to one of the fastest-growing religions in North America. Through mass immigration and mass conversion of immigrants, the small mission to Alaska would become a continent-wide enterprise. By 1917 the Orthodox mission in North America would include more than 350 parishes and chapels, its own seminary, bank, women’s college, monasteries, orphanages, schools, publications, and fraternal societies, with an annual central administrative budget of $500,000. 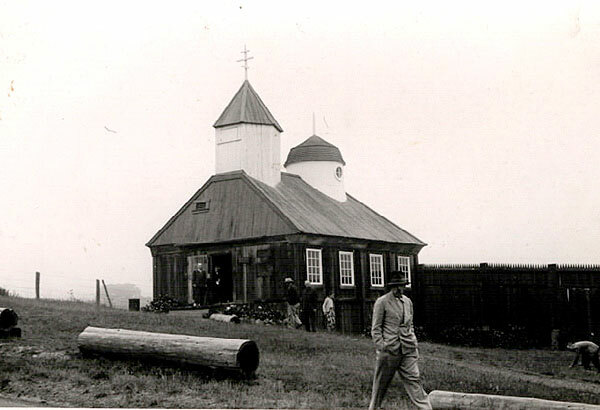 Over a period of two decades the Russian mission to the native peoples of Alaska had become an emerging Church composed of immigrant peoples from many nations. St. Nicholas Church, Olyphant, PA.
With the sale of Alaska to the United States in 1867, however, the future of the Alaskan Mission seemed far less secure. In the eyes of the new American authorities, the Orthodox mission was an unwelcome relic of Alaska’s past. In open cooperation with proselytizing Protestant missionary groups, the new territorial government launched a campaign to “Americanize” the Orthodox native peoples. Orthodox prayers, icons, and native languages were forbidden in the new American schools and denounced from the new Protestant pulpits. Repeated protests by the Orthodox bishop to the President, Congress, and military occupation authorities were ignored. 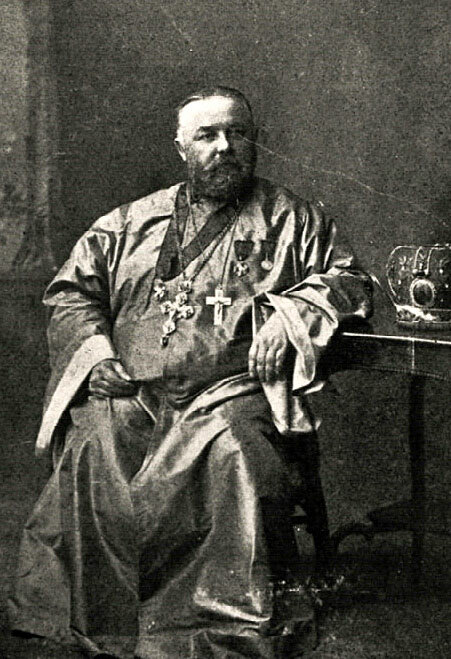 The request of the small Orthodox immigrant community in San Francisco for a priest (1868) gave the struggling Russian mission and its new bishop (John Mitropolsky, 1870-1876) new hope and direction. As the headquarters of the Alaska occupation authorities, and the major terminus of travel to and from Alaska, San Francisco was recognized by Bishop John as the city from which the Alaskan mission could best be defended. At the same time Bishop John, who was fluent in English, saw San Francisco as the base for an Orthodox mission to the United States proper. In 1870, the bishop petitioned the Holy Synod of the Russian Orthodox Church for permission to reorganize the Alaskan Mission into a missionary diocese based in San Francisco. In 1874, the bishop, the mission school, and the diocesan administration moved into the new Orthodox Cathedral of St Alexander Nevsky on Pierce Street, in the “Russian Hill” section of San Francisco. Chapel at Fort Ross, north of San Francisco, where the Russians maintained a foothold for 29 years. Over the next twenty years, Bishop John and his successors in San Francisco, Bishop Nestor (Zakkis) (1879-1882), Bishop Vladimir (Sokolovsky) (1888-1891), and Bishop Nicholas (Ziorov) (1891-1898), laid the foundation for an expanding Orthodox presence in North America. Bishop Nestor began the translation of the Gospel into Eskimo. Unfortunately, he drowned in the Bering Sea while on a pastoral visit to Alaska in 1882. Bishop Vladimir, his successor, focused on the mission to the continental United States. He brought with him eighteen students and five faculty members from the Kholm Seminary, where he had been rector, to assist in missionary work in California. A talented musician, Vladimir translated the common chants of the Russian Church into English to help make Orthodoxy more intelligible to American audiences. He appointed Fr Sebastian Dabovich, the first Orthodox priest to have been born in the United States, as the “English Preacher” for the cathedral. As a result of these efforts, a new, larger cathedral, dedicated to St Nicholas, was built in 1888. It was under Bishop Nicholas (1891-1898), however, that the missionary diocese entered its period of greatest growth. In 1891, 360 Uniates (also called “Greek Catholics”) in Minneapolis renounced Roman Catholicism and joined the Orthodox missionary diocese. In the ensuing 25 years (1892-1917), tens of thousands of Uniates would convert to Orthodoxy throughout the United States and Canada. At the same time, mass immigration, especially of Greeks, would bring hundreds of thousands of Orthodox Christians to North America. The great expansion of Orthodox Christianity across the continent had begun. Prior to 1890, only small numbers of Orthodox Christians had immigrated to the United States. In colonial times (1768), an English land-grant settlement, populated mainly by Greeks, had been established in Florida. Quickly succumbing to disease, exploitation, and neglect, the New Smyrna plantation was forcibly disbanded by British troops on order of the English governor of Florida in 1769. The first Orthodox Church in the continental United States was established during the Civil War in New Orleans by Greek cotton merchants (1864). This “Eastern Orthodox Church of the Holy Trinity” was typical of the earliest Orthodox parishes in America: it was multi-ethnic, composed of Greeks, Slavs, and Arabs, and multi-lingual, services being held in Greek, Slavonic, and English. Between 1868-1892, similar multi-ethnic and multi-lingual parishes were founded by diplomatic personnel, foreign businessmen, and small numbers of Orthodox immigrants in San Francisco (1868), New York (1870-1883), Chicago (1888), Portland, Oregon (1890), Galveston (ca 1890), and Seattle (1892). Following the provisions of the Council of Carthage (AD 419), wherein responsibility for Orthodox communities in a new land is given to that Orthodox Church which initiates missionary work in it, these small communities, numbering altogether some 600 faithful, received priests, financial assistance, and/or liturgical items from the missionary diocese in San Francisco. What was to become the first large-scale immigration of future Orthodox Christians to the United States began with the mass arrival of Uniate peoples from Central and Eastern Europe. From the mountain regions of present-day Poland, Slovakia, Hungary, Moldova, and Ukraine, these peoples were known by various national, regional or linguistic designations as “Carpatho-Russians,” “Uhro-Rusyns,” “Galicians,” “Lemkos,” “Rusins,” “Bukovinians” or “Trans-Carpathian Ukrainians.” Originally Orthodox Christians, the Uniates had been maneuvered into an ambiguous communion with the Roman Catholic Church in the late 16th century. Not accepted as Orthodox by the Orthodox, nor as fully Catholic by many Latin Catholics, the married (rather than celibate) clergy of the hybrid Uniate (or “Greek-Catholic”) Church professed uneasy obedience to the Pope. To the simple Carpathian mountain villager, however, for whom the Uniate clergy continued to celebrate the ancient Orthodox liturgies in Slavonic, the distinction between “Greek Catholic” and “Greek Orthodox” was largely academic. From the 1880’s, Uniate Slavs were sought out by Pennsylvanian coal mine operators as cheap replacement labor for striking German, Welsh, and Irish miners. As conditions throughout Eastern Europe were uniformly harsh—due to poverty, illiteracy, and lack of available land—ever-increasing numbers of Uniate men left for America. The vast majority were young peasants. More than 40% were illiterate. By 1892, more than 40,000 Uniates had reached Pennsylvania. This number doubled by 1900. By 1917 a total of 350,000 Uniates had immigrated to the coal fields of the eastern United States. Their native tongue is far removed from our own, their illiteracy is great, their economic efficiency is low, and their religious and moral training is not up to the American standard. Hence the gap between these people and our people is great. The process of assimilation is difficult, and the task of changing from the old to the new is fraught with danger. (Wilkes Barre Record, 1907 Change and assimilation, however, were not foremost in the minds of the “new immigrants” from Eastern Europe. Unlike earlier generations of American immigrants, many among the “new immigrants” sought only to use the economic opportunities of the New World to create a better future in the Old. The Romanians expressed it most succinctly: “Mia si drumul” (“A thousand [dollars] and home”). As a result many Orthodox “new immigrants” neglected to learn English, and failed to establish more than passing contact with American society. They remained, for the greater part, oriented more towards events in their homelands than those in America. Alienated by nationality, language, religion, custom, and low-status occupation from the surrounding American Protestant society, “new immigrants,” whether Roman Catholic, Uniate, or Orthodox, were compelled for cultural and economic survival to band together into ethnic “fraternal societies.” These “mutual aid brotherhoods,” in turn, help build parish churches to serve as the social, cultural, linguistic, patriotic, and spiritual foci of their marginalized communities during their sojourn in America. For those who planned to stay in America, these parishes became not only repositories of ethnic heritages, but dispensaries for handing down those cultures to their American children. In Russia only the Tsar builds churches. How can you build a church in America?” questioned one immigrant. So the brotherhood devised the following plan. First each of them placed $5 on a table; then the new immigrant was asked to do the same. The new man was then asked to select one of his own friends as treasurer for the money, holding it in trust until such time as it would be needed. Using this approach, the Brotherhood found and attracted many. The parish churches that resulted from the efforts of these local brotherhoods were responsible only to their own “trustees,” that is, to a democratically elected parish council composed of prominent laymen. In most instances it was only after purchase (or less often, construction) of a building that the trustees turned to a bishop for a priest. Unlike other Eastern European Catholic immigrants (Poles, Hungarians, Czechs, etc. ), Uniate Slavs could not easily merge into the Roman Catholic Church in America. Seeking to forestall a resurgence of “Cahenslyism”—a 19th century lay movement in American Roman Catholicism that demanded that priests and bishops be of the same ethnic background as their parishioners—the Catholic bishops in the United States openly sought to discourage the establishment of specifically Uniate (Greek Catholic) parishes. Largely ignorant of the historical, cultural, linguistic, and liturgical particularities of the Uniate Church, the Catholic bishops preferred that Uniate “new immigrants” attend instead existing Latin-Rite Hungarian, Polish, or Slovak parishes. This general hierarchal antipathy was exacerbated by the reluctance, and often refusal, of Uniate “trustees” to sign over their new parish properties to Irish-American bishops as required by Roman Catholic canon law. Lawsuits, forced evictions, and even occasional rioting were not uncommon as “independent” Uniate parishes, led by their trustees, struggled with authoritarian, and increasingly hostile, Latin-rite Catholic bishops for control of Greek-Catholic properties and assets throughout the United States. Fr. Alexis Toth was instrumental in returning some 20,000 Eastern-rite Catholics to the Orthodoxy of their ancestors. Fr. Alexis Toth was canonized in 1994. 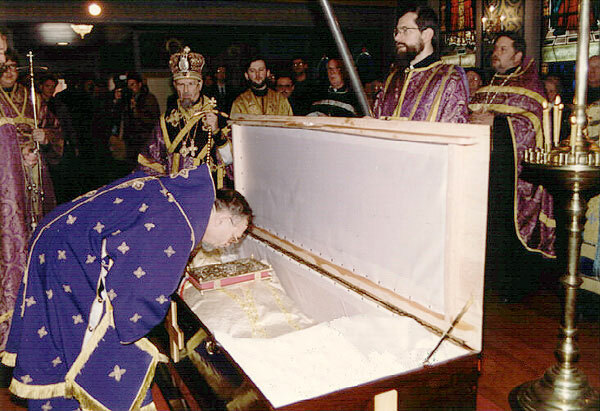 Metropolitan THEODOSIUS venerates the relics of St. Alexis at St. Tikhon’s Monastery where they are enshrined. The Archbishop lost his temper, I lost mine just as much. One word brought another, (so) that the thing had gone so far that our (further) conversation is not worth putting on record. Unable to secure recognition or assistance from Archbishop Ireland, Toth and the angry trustees of St Mary’s began to travel to other Greek Catholic parishes in America seeking help. One trustee, a layman, John Mlinar, was sent to distant San Francisco to determine if the Russian bishop could be of assistance. After being graciously received by Bishop Nicholas, an excited Mlinar returned to Minneapolis with a generous donation of icons—a gift from the missionary diocese to the struggling parish. A correspondence between Toth and Bishop Nicholas ensued. A short time later, on March 25, 1891, Toth and his entire community of 361 parishioners were received “back” into the Orthodox Church their forefathers had left three centuries earlier. In 1994 Fr Alexis Toth was canonized at St Tikhon’s Monastery, South Canaan, PA.
Toth became a tireless advocate of a general Uniate “return” to Orthodoxy among the Greek Catholic population of America. Toth’s personal efforts, combined with the continuing pastoral insensitivity of Rome, led 65 independent Uniate communities with some 20,000 parishioners into Orthodoxy by the time of his death in 1909. For many Uniates the choice between the culturally insensitive, heavy-handed demands of the Roman Catholic bishops, and Slavic sensitivities, pastoral care and generous financial assistance of the Orthodox missionary diocese was clear. Moreover, this religious re-definition from “Greek Catholic” to “Russian Orthodox Greek Catholic” led many Rusyn, Galician, Ruthenian, Uhro-Russian and Carpatho-Russian Uniatesto accept cultural redefinition as well. Toth’s own Minneapolis parish formed a “Russian Women’s Society” (1904), a “Russian Brotherhood” (1907), a “Russian Library Society” (1908), and a “Russian Theatrical Society” (1911), although in the words of one immigrant, “There was not a single man from Russia in the city of Minneapolis.” Critics, especially Roman Catholics, complained that pan-Slav nationalism, not religious faith, fueled the mass conversions. In an increasingly tense and emotionally charged atmosphere, critics charged that the spreading cultural and religious redefinition among the Carpatho-Russians was nothing more than “russification.” Yet it was the publication of the Papal Decree Ea Semper in 1907 (requiring, among other things, celibacy of the Uniate clergy in America) that most dramatically increased conversions to Orthodoxy. By 1916 the Roman Catholic Church had lost 163 Uniate parishes, with more than 100,000 faithful, to the Russian missionary diocese. Services were held in Slavonic, Greek, Arabic and Serbian. Given the ethnic divisions paramount in contemporary North American Orthodoxy, the multi-cultural, multi-lingual, and multi-ethnic diversity of the missionary diocese may seem distant indeed. By 1910, the largest number of Orthodox immigrants entering America were ethnic Greeks. Although most Greek immigrants came from mainland Greece, between 1890 and 1920 an immigrant of Greek nationality and Orthodox faith might enter the United States with Greek, Turkish, Italian, Bulgarian, Romanian, Russian, or British citizenship, depending on which power was currently occupying which remnant of the former Byzantine Empire. Estimates suggest that 300,000 Greeks arrived in the period 1890-1910, with the majority arriving after 1905. An additional 300,000 arrived between 1911 and 1920. As with the Slavic Uniates, Greek immigration to the United States was based on poor economic conditions (in this case the collapse of the export currant market), exaggerated reports by the newly-immigrated of “wonderful opportunities” in the United States, and after 1897 the perpetual threat of war between Greece and her Balkan neighbors. Like the Slavs, Greeks shared a continuing link to the Old World in a way earlier immigrations had not. By 1910, the Greek economy had become so dependent on the repatriated funds of Greek immigrants in America that the Greek government could do little to slow emigration, despite continuing, massive losses of manpower. Interestingly, during the Balkan War of 1912, more than 40,000 Greek-Americans heeded the Greek government’s pleas and went back to Greece to fight. Overall, between 1910 and 1930, it is estimated that more than half of all Greek immigrants to the United States returned to their countries of origin. There were cultural differences between the Slavic and Greek Orthodox immigrations. Upon arrival in America, Slavs quickly dispersed to the coal towns of rural Pennsylvania and the related industrial centers of the Midwest. Greek immigrants, however, remained profoundly urban. In 1920, fully 88% of all Greeks lived in urban areas, with the majority in large Greek enclaves in New York, Chicago, and in towns around Boston. Unlike the Slavs, who relied on the poor but steady wages of industry, Greeks sought immediate economic independence through creation of small businesses. The Greek grocery, flower shop, shoeshine stand and candy store are largely things of the past, but the Greek restaurant remains an enduring feature of American cities. It is unclear why rural peasant Greeks went into business, while rural peasant Slavs did not. Nevertheless, small Greek businesses, labor intensive and requiring relatively little capital investment, became dominant and self-perpetuating in the Greek community, as one immigrant generation provided employment to the next. This tendency to cluster, both in economic and geographical terms, made Greeks easy targets for occasional anti-immigrant, American nativist sentiment. In 1909, for example, a bill was submitted to the Rhode Island legislature to prohibit non-citizens (i.e., Greek immigrants) from offshore fishing. A more tragic incident occurred in 1912 in Omaha, Nebraska, when a Greek transient killed a policeman. Within days all Greek-owned businesses had been burned to the ground, and the entire Greek community of 1200 persons was forced to leave the city. In 1892, the Greek immigrant “Society of Athena” of New York City sought to establish a specifically “Greek Orthodox” parish church in New York City. (An earlier, “Greco-Russian Chapel” in New York, under the auspices of the <$Imissionary diocese, the>missionary diocese, had closed in 1883.) Rather than request a priest or assistance from the “Russian” bishop in San Francisco, the Society’s lay trustees petitioned the more familiar Holy Synod of the Church of Greece for help. These trustees’ desire for an “ethnic” parish and their refusal to recognize the administrative or canonical authority of the missionary diocese, the missionary diocese were to set fateful precedents for later Greek immigrant parishes, and for Orthodoxy in America as a whole. Between 1892 and 1920, more than 150 new Greek parishes followed the lead of this New York community and incorporated apart from the missionary diocese. Roughly half looked to the Church of Greece for assistance, the others to the Greek-speaking Ecumenical Patriarchate of Constantinople. For its part, the missionary diocese did attempt to minister to the Greek “new immigrants.” In the western United States, Greek laity were integral members of parishes in the missionary diocese. Numerous Greek priests served in the diocese’s multi-ethnic parishes. The Greek-American Fr Michael Andreades, dean of the western parishes of the missionary diocese, even visited the Ecumenical Patriarch in 1912 with an official request from the diocese that the Patriarchate nominate a suitable candidate to serve in the missionary diocese as a bishop for the independent Greek parishes. Fearing the anger of its Turkish oppressors, who had already warned the Patriarchate not to be involved with the anti-Turk Greek-American parishes, the Patriarchate refused. The missionary diocese regularly provided antimensia, altar cloths necessary for the celebration of the Divine Liturgy, to new Greek parishes. Not untypically, in 1902, Fr Vladimir Alexandrov received a letter from the Ecumenical Patriarch Joachim III thanking the Seattle priest for his “zealous missionary work among the Greek people.” In Chicago that same year, Bishop Tikhon (Bellavin), head of the missionary diocese, even served liturgy in an “independent” Greek parish—entirely in Greek. When he attempted to serve in a Greek parish in New York City in 1904, however, the bishop, who was unaware of the parish’s “independent” status, was pointedly asked to leave by its angry trustees. Ultimately, the growing division between the Greek “new immigrants” and the missionary diocese was due to a fundamental lack of empathy on both sides. Proud and ethnocentric Greek immigrants feared “Russian” control of their parishes, much as the Slavic Uniates had feared Latin control of theirs. The equally proud Russian bishops of the missionary diocese resented, in the sarcastic words of one, “...the traditional self-sufficiency of Greeks in all matters of religion and faith.” It is ironic that ethnic chauvinism and disputes over control of parish properties—which had led Uniate immigrants into Orthodoxy—should be the same factors that led Orthodox immigrants in America to splinter the emergent immigrant Church’s unity. By 1916, the majority of the roughly 300,000 Orthodox Christians in America were no longer Alaskan native peoples, nor Slavs in the missionary diocese: they were Greeks in independent “trustee” parishes. According to the 1916 US Census of Religious Bodies, “Eastern Orthodoxy” had been the fastest growing denominational family in America in the preceding decade, showing an incredible 25,000 percent increase in number of adherents. The rapid proliferation of independent Greek parishes (more than 140 were established between 1906-1916 alone), and to a lesser extent those “independent” Romanian, Bulgarian, and Ukrainian parishes which imitated them, overwhelmed the understaffed missionary diocese’s ability or desire to deal with the canonical, legal, and administrative problems they engendered. As America entered the First World War, the Orthodox in America were separating into two distinct patterns of church administration. The older missionary diocese, which functioned on local, regional, national and international levels, was rapidly emerging as a multi-ethnic, North American immigrant church. The unorganized, suspicious, and ethnocentric trustees of the Greek parishes, however, remained resolutely parochial in their perspective. Both, however, were to be swept aside by the tumultuous events to come. This church was severely damaged by fire the following year. It was renovated and reconsecrated in honor of the Holy Trinity. The 1906 earthquake destroyed the building and a new edifice was constructed at a new location, on Green Street, where the cathedral stands today. 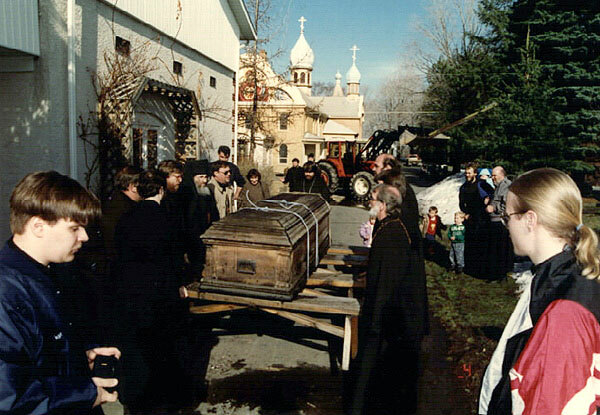 In recognition of the results of his missionary work, Fr Toth was glorified as a saint by the Orthodox Church in America during canonization ceremonies conducted May 29-30, 1994, at St Tikhon’s Monastery in South Canaan, PA, where his relics lie enshrined. As cited in Kuropas, Ukranian American, p 55.